Getting into an accident can be frustrating, stressful and exhausting – to say the least. Just know that you are not alone; no one is able to breeze right through the process, as there are so many moving parts. For decades now, car insurance companies have encouraged drivers to send in photos of car damages surrounding auto insurance claims. From throwaway cameras in the ‘90s to pocket-size point-and-shoots from the early ‘00s, all the way to today’s convenient and high-quality smartphone cameras, cheap and easy photo opportunities have been an option for quite some time. Even if it may seem like a pain, taking photos is hard evidence supporting your claim. With a decent phone on your person, there really is no reason why you should not comply with this important request. The team at MyDriverLicenses.org encourages you to take these important photos when filing your next auto insurance claim. The first set of photos you should be sure to snap when you plan to file a claim with your auto insurance company are those of the damages done to your vehicle. Whether or not you were at fault during the time of the incident is irrelevant to the physical damage done to your car. Your insurance plan should cover your vehicle (with a deductible) whether you caused the problem or not. Photos of the damage done to your car will help the claims representative assess the issues, and can help you obtain an estimate sooner than later. If there were any other vehicles involved in the incident, make sure to take photos of them, as well. 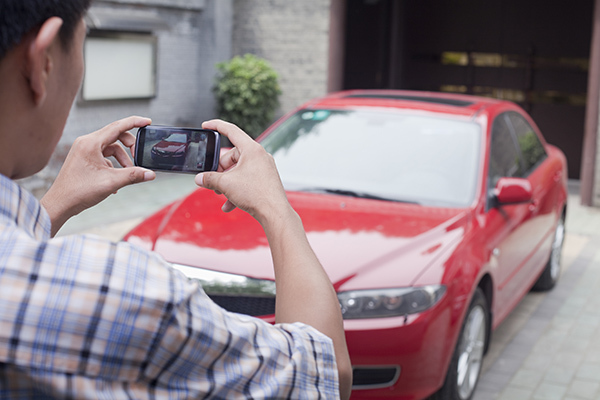 If you were at fault, it is especially important to take photos of the other vehicle(s), as your personal auto insurance provider will be the company that is taking care of fixing these vehicles. The experts at MyDriverLicenses.org recommend explaining the situation to other car owner(s) prior to taking pictures, so they do not feel solicited or exploited in any way. If you are filing a claim because your car was damaged due to an Act of God (like a tornado or a hurricane), or a tree branch fell on and cracked your windshield, it is important to take pictures of the scene, as well as any elements you can identify in helping the insurance claims adjustor assess the situation. If your car was stuck in a flood, make sure to take a picture of your car stuck in the flood. In these situations, the team at MyDriverLicenses.org believes your picture may not only be worth a thousand words, but that it can also save you thousands of dollars in car repairs – with the necessary proof. Even though this is not required of you, MyDriverLicenses.org experts recommend also snapping photos of vehicle-related documents and credentials to make it easy to locate the details you need, exactly when you need them. If you are the victim in a car accident, there should be no reason why the other driver should deny your request to snap pictures of his or her license, car registration documents, license plates and car insurance card. If the other party has a problem, allow him or her to cover any details they do not want photographed. All of these items will assist in proving an incident occurred, even if the other driver decides to leave the scene of the accident.